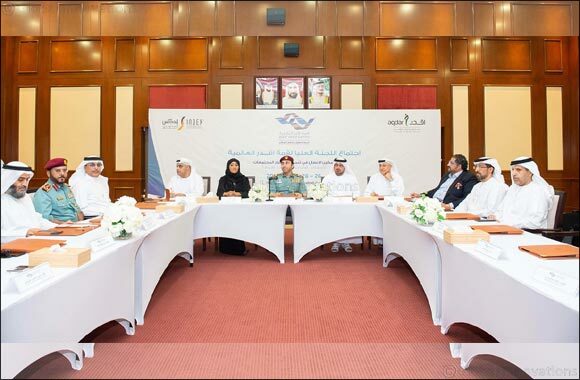 Dubai, United Arab Emirates, 27 May 2018: The Higher Organizing Committee of Aqdar World Summit held a meeting earlier at the headquarters of the Ministry of Interior in Abu Dhabi that was chaired by Major General Dr. Ahmed Naser Al Raisi, General Inspector at the Ministry of Interior and Chairman of the Higher Organizing Committee. During the meeting, they discussed the plans and agenda of the second edition of Aqdar World Summit which will be held under the patronage of Lt. General HH Sheikh Saif bin Zayed Al Nahyan Deputy Prime Minister and Minister of Interior on 26-28 November at the Abu Dhabi National Exhibition Centre (ADNEC). The Higher Organizing Committee of Aqdar World Summit also announced the theme of the second edition which will be “Developing sustainable societies through human development: Regulations – Skills – Knowledge – Opportunities.” The meeting also addressed the main topics to be discussed during the summit in addition to the participating exhibitors in the parallel exhibition. The committee were also briefed on the local and global top-notch speakers presenting at the summit. The meeting was attended by representatives of the Ministry of Interior, Ministry of Foreign Affairs, Ministry of Education, General Authority for Islamic Affairs & Endowments, National Council, General Women's Union, Higher Colleges of Technology, Dubai School Agency (DSA) of the Knowledge and Human Development Authority (KHDA), INDEX Conferences & Exhibitions and the United Nations Office on Drugs and Crime (UNODC) for the GCC countries. He further added: “Certainly, the theme of the summit this year, ‘Developing sustainable societies through human development: Regulations – Skills – Knowledge – Opportunities' highlights a topic of great importance to various worldwide communities, so that they can deal positively with challenges and contribute to the development and stability of their countries and societies. On his part, H.E. Dr. Abdullah Al Raisi, Chairman of the Scientific Committee of Aqdar World Summit, thanked His Highness Lt General Sheikh Saif bin Zayed Al Nahyan, Deputy Prime Minister and Minister of Interior of the UAE for the trust and confidence reposed in him and also extended his gratitude for the guidance and support offered by His Highness for the summit. He stated that the organizing committee will continue its efforts with great motivation to successfully organize the 2nd edition of the summit this year. Dr. Al Shamsi said, “The theme of this year's summit also reflects UAE's effort in empowering the youth to overcome future challenges. Today, we are dealing with the rapid changes taking place across the globe within the framework of the ‘Fourth Industrial Revolution' and in order to find solutions to such challenges, the summit will bring together experts from various fields, who will speak about the key scientific and technological developments and the amazing growth potential of artificial intelligence. In addition, the summit will showcase the best international practices that support the development of human resources which enable the individual to successfully deal with these challenges and help contribute in building better communities. Aqdar World Summit is organized by INDEX Conferences & Exhibitions – a member of INDEX Holding, in cooperation and partnership with the Khalifa Empowerment Program “aqdar”, UN, United Nations Educational, Scientific and Cultural Organisation (UNESCO), Ministry of Education, Department of Education and Knowledge in Abu Dhabi and Knowledge and Human Development Authority in Dubai.